How would we create an app that allows someone to plan their visit to the San Diego Zoo ahead of time? Although the zoo currently has an interactive map application, there is limited support for helping a user prepare for their visit beforehand. Imagine this. You’re a busy parent with a flourishing career, trying to balance your work life with raising a 4-year-old daughter. You’d love to spend as much time as you can with her, but sometimes there just isn’t enough time to plan things out. This is Sam. She’s a user persona that I developed from my user research of trawling through Google Reviews of SDZ. I did not have the resources to conduct a qualitative research study about who exactly are the people visiting the San Diego Zoo. So, from what I know about the people who work and live in California, and the common demographics of zoo visitors, Sam came to life. My target user is someone who is short on time, family-oriented, and looking to have the best time possible at the zoo. While there are visitors to zoos who are not children or parents, for time and resources sake, I am focusing on a busy parent archetype. I wanted to find out common pain points of zoo visitors that could have been solved if they had planned their visit before hand. To do this, I trawled through Google Map reviews of San Diego Zoo. My hypothesis before conducting research was that most SDZ visitors would have issues with navigating through the zoo despite having an interactive map. I believe that the experience of navigating a zoo is completely different from regular navigational experiences users encounter in their daily lives. The zoo is huge; visitors sometimes have trouble navigating. The visit requires more walking than what was expected; proper footwear is essential. Animals are sometimes sleeping or not outside. The navigational map is not rotatable and does not match the physical map. Out of all the alternatives I considered, the phone app was the most feasible. An interactive map would be very expensive in terms of hardware, and would be too scarce of a resource considering the number of visitors there are. Personal assistants would be extremely costly to the organization and not a good allocation of resources. There is already an interactive map app, so it makes a lot of sense to build a mobile app! I plotted the several possible features of the solution on a value vs. effort matrix to evaluate whether they were feasible to the San Diego Zoo to implement. I chose the top 2 features that balanced both value and effort which were Zoo Conditions Dashboard, and Plan a Trip tool. Given more time, I believe that the Animal Schedules feature would also be very valuable to implement, and is up next for an iteration. This was also a good time for me to think about Sam. What would she want? Would Sam want a VR map to show her around the Zoo? Probably not. She’s too busy looking after her daughter to pay full attention to a VR map. While calling a guide sounds nice in theory, it involves a lot of waiting around and queueing. Sam just wants to get going so her family is not sitting around in the hot San Diego sun. These were the main reasons why I scrapped the guide and VR map feature ideas. Here is an interactive prototype of the design: http://bit.ly/sdzooapp, created using InVision and Adobe Illustrator. San Diego Zoo branding is fun and funky; Landor, who rebranded SDZ, describe it as being able to ‘surprise and [engage] audiences’. To stay consistent with the company’s branding, I stuck with green and dark cyan (the main colours featured in their marketing material). Being a family-friendly and fun institution, I included cute artwork of zoo animals to surprise and evoke a sense of playfulness in users. (Art credit to Rawpixel.com - Freepik.com) Buttons and squares are rounded to keep consistent with the fun and funky vibe. 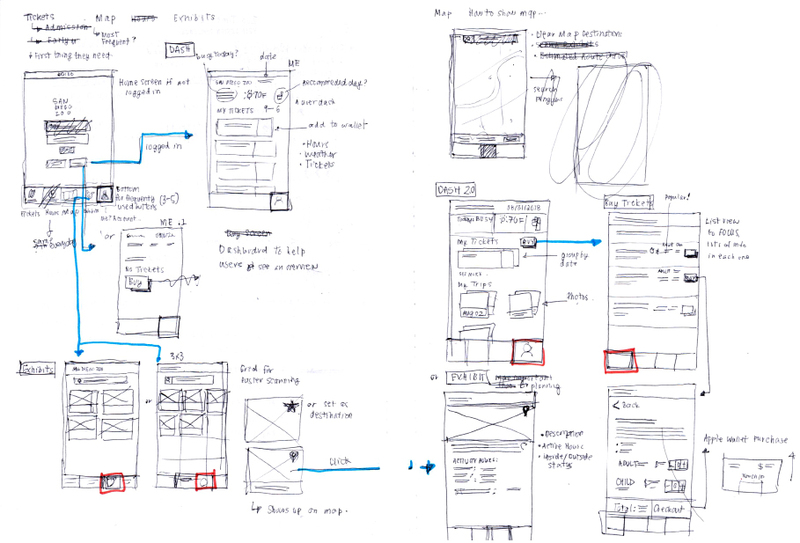 Many of my design decisions were made based on assumptions. For example, I assumed that for most parents, the date of a trip was a secondary decision to who was coming on the trip. With more resources and time, I would delve deeper into user research and conduct evaluations on the existing system and the prototype. Due to feasibility constraints, I was only able to implement the trip planning function for a 1-Day pass. 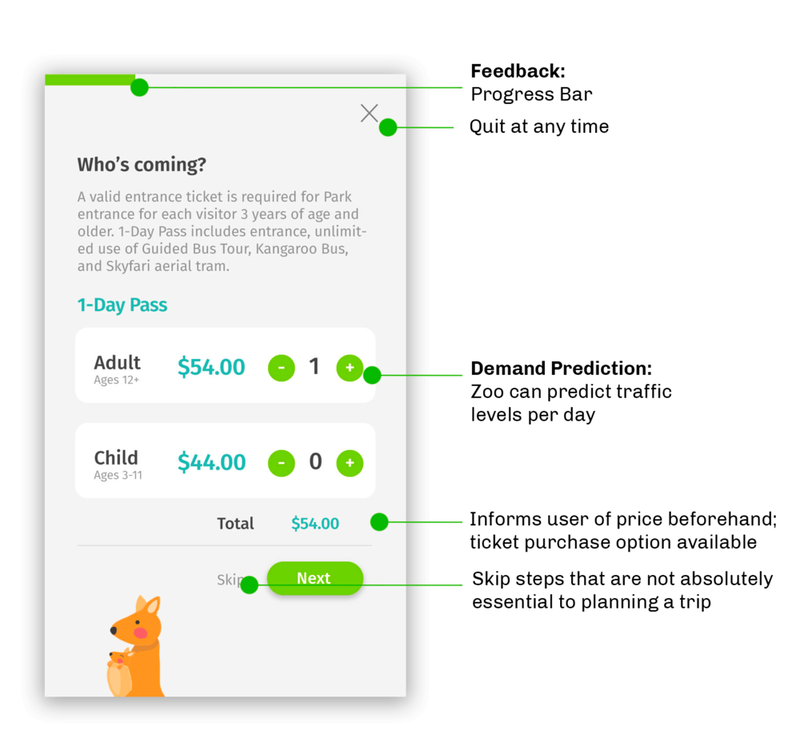 As there are multiple kinds of passes, it would be helpful for usability studies to fully implement functionalities for different kinds of zoo passes. I would also like to design Animal Schedules next.